Remote access removes boundaries, eliminates the need for time consuming site visits and provide a network infrastructure suitable for today’s “always-on” society. 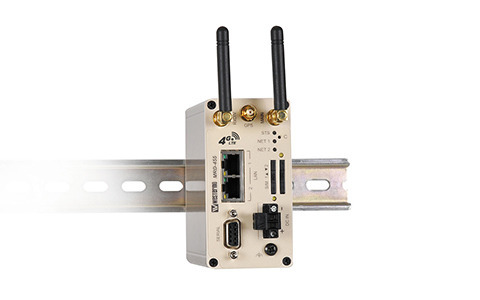 The MRD-455 industrial mobile broadband GPRS / EDGE / 3G / 4G LTE router uses the Internet to cost effectively inter-connect systems, allowing HMI, PLCs, sensors etc to communicate with each other. A compact design bundled with all interfaces and LEDs in the front make the unit extremely well suited for industrial applications. With isolation between the PSU and the Ethernet and serial ports the MRD-455 protects against issues caused by ground loops. Devices connected to the Internet require countermeasures towards cyber threats. The MRD-455 offers protection of transmissions from malicious eavesdroppers via encrypted communication tunnels (VPN), and features a simple, yet powerful, packet inspection firewall. or change any other component.